The rabbis that serve the communities these ‘people’ live in say it is OK to kill men, woman and children…. So why not break the Sabbath as well…. it’s all for the cause of hate…. 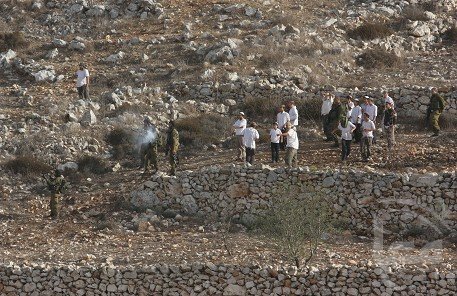 the newest, holiest code of the settler…..
Nablus – Fifteen Israeli settlers from the Yitzhar colony near Nablus attempted to set fire to a home in the village of Burin, Palestinian sources said Saturday. Palestinians told Ma’an that Israeli officials from the Civil Liaison Office arrived in the area shortly after the confrontation. So, why did the Hebrew speaking Palestinians convert to Islam in the 7th Century, was it because they found Islam to be more a religion of peace than the horrific Old Testament stuff where putting to the sword all the inhabitants of a town was urged as a regular practice on the followers ? Maybe the Ashkenazi/Khazar sorts who’ve compounded such OT thinking with later Talmudian discourses, and so `know` for sure that God speaks to them alone, ought to pause a moment, given the ~200 expulsions from host communities over the last 2500yrs, that in the present day any prospective host community is going to know well, unlike in former times, all about the `long suffering Jews` who’ve been `mercilessly persecuted` by an `envious host`. All the prospective host nation’s people need do is call up your indelible current CV – the thousand pictures of shattered and burnt Lebanese and Palestinian innocent dead `men women and children`, as prescribed by the living incarnations of your long dead `sages`, to know that any decision made by their govt to overlook such unbearable baggage will be met with a revolt until such a decision is rescinded. Of you who do these things, or otherwise are supportive of such mayhem, and would want to come to Australia after your Zionist experiment has collapsed, i certainly would speak/write against you, saying that we would be the New Palestine and be poorly treated as soon as possible by the new arrivals from the collapsed Jewish State. For the last couple months orthodox Jews in Jerusalem who determined it is lawful to riot on the Sabboth have been doing so. It started over a parking lot. For the last two weeks it has been an Intel plant.